More surface designs…of the non-printed type. Currently loving embroidery, Afro-Martha style. But I haven’t had a chance make something with it yet….so here it goes: Drumroll please! Introducing Diamonds and Chevs by YayToonDay Designs! The design on this fabric is inspired by my love of ethnic geometric prints, Yoruba heritage and love of color! 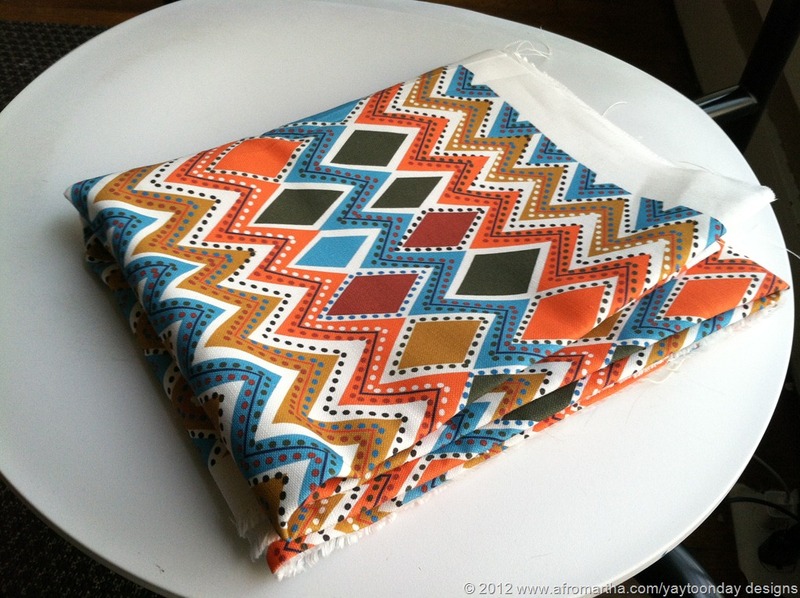 The fabric in the pictured is printed on Spoonflower’s Cotton/Linen blend, but is also available in other fabrics. Yardage is available for sale here. All smiles over here! I love your new design. Yay! How does the fabric reflect Yoruba heritage? It reminds me a lot of the textiles indigenous to the Americas, but with an improvisational approach that’s clearly of African origin. Congratulation on your new fabrics, I’ll definitely support and buy! Thanks for stopping by, and for your support. To answer your question, I believe that my designs (on this fabric and others) reflect my Yoruba heritage because my heritage permeates everything I do, having been born and spent my childhood in Nigeria. I have combined that heritage with my American experience because I am also influenced by it, having spent about 2/3rds of my life here. 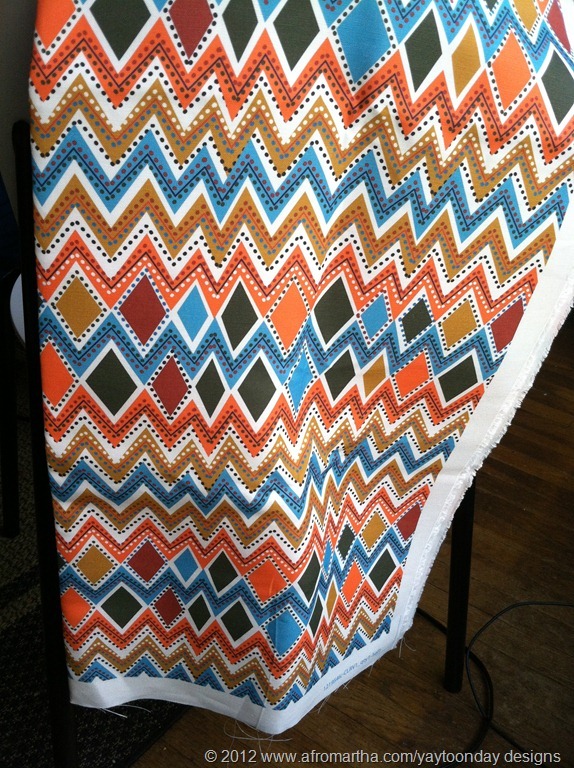 As you noted, yes, my fabric design employs the improvisational approach that is clearly of African origin. I specifically claim ‘Yoruba’, not the blanket ‘African’ because Africa is not a country, and Africans are not a monolith. I can only claim that which is my heritage, therefore the designation of the work as being Yoruba. Aesthetically, my work is clearly Yoruba in it’s origins as evidenced by the use of geometrics, particularly the zig zag pattern, as seen here and dotted lines(as seen here), and (as seen here) and here. The color choices? Those are strictly personal choices because I like bright vivid saturated colors, rather than the darker, moodier more muddied color stories prevalent in African fabrics. So I guess you could say I’ve done a mash-up of influences that result in a design that can be subject to the viewer’s interpretation.